AIA began in 2000 in Palm Springs, California, with the name, Desert Paws. Over the past 14 years, we have evolved and gradually expanded our mission and activities. Initially, we assisted other animal welfare organizations and shelters in the Coachella Valley by having fundraisers and donating the proceeds to them. In addition, for over a decade Desert Paws published a full page advertisement in the newspaper, The Desert Sun, showing adoptable dogs and cats in shelters around the valley. The advertisements featured animals facing euthanasia and were successful in saving the lives of many homeless animals by encouraging people to adopt them. The ad, which was provided as a free service to all the shelters in the community, also contained educational messages on responsible pet guardianship. In 2002, we created and distributed hundreds of colorful plastic window plaques reminding people not to leave their pets in the car. These were placed in storefronts and restaurants around the valley, where many still remain displayed. Over the years, we provided tens of thousands of dollars to various groups to support free spay and neuter and vaccination services for low income families. We have also helped other organizations purchase needed equipment such as durable animal enclosures and we continue to help out when we can for worthy projects. In 2004, Desert Paws conducted a conference, in partnership with the Humane Society of the United States, called First Strike. Its goal was to teach people about the connection between abuse toward animals and human interpersonal violence. Frequently, animal abusers go on to be violent, antisocial people. Also, when there is animal abuse or neglect in the home, there frequently is associated spousal or child abuse. The conference was very well attended by social workers, law enforcement, animal control officers, animal advocates and the general public. Speakers from the American Society for the Prevention of Cruelty to Animals, Humane Society, and others gave great presentations. After leading this conference, we decided that a greater part of our mission would be to provide quality information about animals and their place in society; especially animal welfare issues and concerns. Ultimately, this led us to develop the radio show, Animals Today, which began locally in 2009 and focused primarily on companion animals. The show has broadened its content to include issues and events concerning all animals, companion, wild and farmed. Animals Today has experienced continuous growth and is now broadcast on America’s Talk Radio Network, airing in numerous markets around the country. The tag line of Animals Today is “Your home for serious talk about Animals.” The goal of the show is to provide thoughtful and intelligent discussion and analysis about animals and their environments, and the relationships we have with animals, all from a perspective of promoting greater compassion and respect for them. Lori has interviewed various famed personalities including Bob Barker, Tippi Hedren, and Dean Koontz along with numerous others. Also appearing on the show have been politicians, lawyers, filmmakers, ethologists, and a variety of experts in all aspects of animal welfare and animal rights. Lori interviewed whale protector, Paul Watson, The Sea Shepherd, a woman known as the Penguin Lady, and an individual who is referred to as the Snake Man! In producing Animals Today, we have met some of the most inspiring and dedicated people you will ever encounter in any walk of life. The show is streamed on line and then archived as a free podcast on YouTube for anyone in the world to enjoy and share. Animals Today gives individuals and organizations a powerful way to promote their causes. In 2010 Desert Paws hosted the Coachella Valley commemoration of International Homeless Animals’ Day, where dog and cat lovers gathered to remember all the dogs and cats without homes who were euthanized that year. America’s first animal rights attorney was the special guest speaker at that event. The 2011 of International Homeless Animals’ Day featured an inspiring short film about a group who emptied out a Georgia shelter of all its animals in one day. In 2011, Desert Paws officially became Advancing the Interests of Animals, a change made to reflect the organization’s expanded mission and reach. The new name was announced at the Courage in Action Celebration, held in Rancho Mirage, California. The gala featured guest presenter Barry Manilow who joined Dr. Kirshner on stage to present awards to community members for their extraordinary work on behalf of animals. 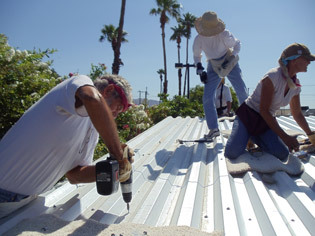 Starting in the summer of 2011, Advancing the Interests of Animals devoted considerable time, effort, and resources by leading a project to construct sturdy metal coverings over the outdoor dog kennels of the Indio, California city shelter. After repeated pleas from AIA and the community urging the city to give protection for the dogs in the outdoor kennels, the city finally agreed to allow them to be constructed, but would not financially support the project. AIA is proud to have donated major funding for the construction, which provided welcomed relief from the intense desert sun for the animals. Unfortunately, the new coverings addressed only one of the many deficiencies and problems at the Indio shelter. Needless suffering and deaths continued to occur due to the shelter’s deplorable conditions and inhumane treatment of dogs and cats housed there. Overall, AIA devoted more than 2 years attempting to work with and assist the city to improve the shelter’s condition and encourage more humane care for the animals; yet our efforts were consistently met with resistance. Ultimately, concluding that the city was unwilling or unable even to comply with county and state regulations governing shelter operations, AIA decided to file a lawsuit in 2012 against the City, its police department and the shelter. The necessity of Advancing the Interests of Animals’ legal action was validated when a Grand Jury report, released in May 2013, confirmed almost all of our allegations. Ultimately, the city chose to close the shelter, paving the way to more humane treatment for Indio’s homeless animals. AIA’s outstanding advisory board consists of nationally acclaimed animal advocates who support our mission. In 2014, we also welcomed two new executive board members, Bob Ferber and Joe Seoane. AIA’s main projects and campaigns in 2014-15 are worldwide education through the Animals Today radio show, revitalizing and growing the volunteer program at Coachella Valley Animal Campus, and growing and expanding our multi media campaign to promote responsible pet guardianship in Spanish speaking communities.